Watercolour by Hyder Young Hearsey (1782-1840) of a view of Badarinath in Garwhal, Uttar Pradesh, dated 29th May 1808. 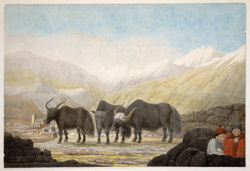 This view, showing the snow-covered mountain in the background and three yaks and two boys in the foreground, is inscribed on the back in ink: 'Badrinath in Garhwal l808'. This image was taken while Hearsey accompanied Lieutenant Webb and Captain Raper on an expedition to discover the source of the Ganges. Raper's journal was communicated to the Asiatic Society by the President and published in Asiatick Researches, volume xi, 1812. Raper wrote in his journal, "29th. Therm. 59. The morning cloudy, the wind sharp and piercing. Marched to Bhadri-Nat'h...Our encampment was about two furlongs to the south of the town, near a small stream called Ruca Ganga, which derives its source from the snow...On this day's route, we passed over several beds of snow; some of which could not be less than seventy or eighty feet in thickness. The river was, in some parts, entirely concealed by the snow; which was so firmly congealed, as hardly to receive the marks of pressure...We are now completely surrounded by hoary tops, on which snow eternally rests, and blights the roots of vegetation. The lower parts of the hills produce verdure and small trees. About mid-way, the fir rears its lofty head; but the summits, repelling each nutritious impulse, are veiled in garments of perpetual whiteness."